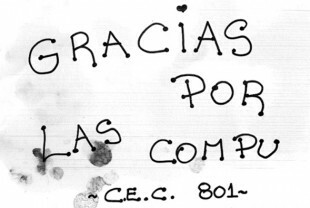 On the 20th of July, Mercap donated many different pieces of hardware (such as keyboards, screens, cables and mouses) to the Fan Sub-Commission of the San Lorenzo de Almagro Athletic Club (SCH CASLA). The Sub-Commission, bit by bit, takes care of sending them to the schools that need them. The first donation already arrived. Two computers were delivered to the Complementary Education Center N° 801 in Villa la Cava in Beccar, San Isidro, Buenos Aires Province. At Mercap we always foster these type of actions, be they staff or company initiatives. In this case, we were able to network with SCH CASLA thanks to two members of the company, Romina Castiñeiras and Lucas Godón, who we also congratulate for their generous idea, and Horacio Gandara, representative of the Sub-Commission.